You have your choice of payroll companies. But don’t make the mistake of thinking it’s a commodity service to select based on price alone. Here are a few example scenarios in which we think we can help. If the person who is responsible for your payroll isn’t trained in payroll, the Commonwealth system is an ideal solution for your business. It has an intuitive interface and manager sign-off options that will allow you to feel 100% confident that every payroll run will be right every time. And when questions do arise, just call us. Our employees are payroll experts who can answer your questions, troubleshoot with you, or identify potential issues before they happen. If your payroll process hasn’t evolved lately, you’re likely missing out on the valuable features now available. 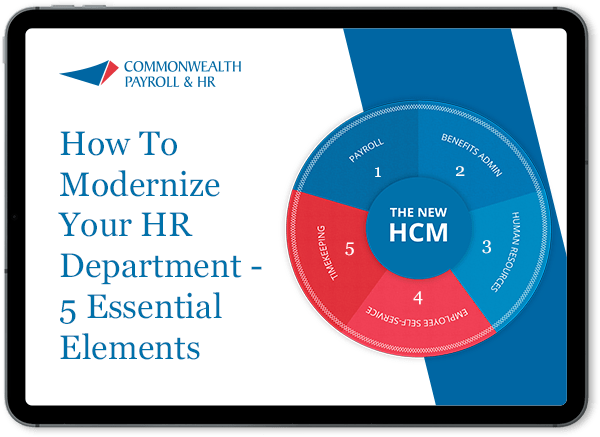 With Commonwealth you’ll have access to a fully customizable system that integrates payroll with HR, benefits, and time & attendance for a powerful dashboard, self-service by employees and robust reporting features. If your current payroll company isn’t able to offer solutions for meeting new regulatory requirements like the ACA (Obamacare) or mandatory sick pay, it’s time to make a change. The Commonwealth solution will help you implement a stress-free process to seamlessly satisfying Uncle Sam’s requirements. It’s our job to work for you, which includes understanding how comfortable you and your employees are with technology and tailoring our system to meet your needs. Managing HR includes a lot of documents; W-2s and 1099s, benefits forms, annual reviews, and more. Serving these documents up efficiently on demand can be extremely difficult, or exceedingly simple… employee self-serve even! Let us show you how the Commonwealth solution can meet your document storage and organization needs. The same system that will meet your company’s needs at a smaller size may not scale well as you grow. The Commonwealth solution will provide you with a framework that will enable your company to deal with your headcount as you grow. You’ll have features that you can turn on when you need them such as sick pay or ACA compliance. We’re an ideal solution for start-ups and companies that want the ease of a PEO without the loss of control. Companies with variable hour employees have time and attendance needs that can make payroll especially complicated. Commonwealth can help you cover all the bases from clock-in to overtime to sick time to payroll. What HR or payroll problem are you trying to solve? We’re confident that we have a solution for you. Please let us know how we can help!